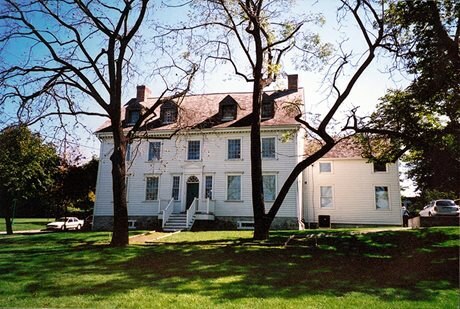 Alexander Duff (1770-1809), one of the founders of Sandwich, built the house in 1798 and used it as a base for his fur-trading operations for nine years. James Baby, a prominent Upper Canadian politician, military officer and businessman from an old Quebec family, purchased the house from Duff in 1807. During the War of 1812, Baby is reputed to have hosted a dinner attended by the great Shawnee chief Tecumseh. The house survived attack, occupation and looting by American troops. In his claim for losses, Baby stated that it had been "stript." The older neoclassical interior fittings appear to date from the house's post-war refitting. Read more about Duff-Baby House. Read “Choosing sides: French presence on the Detroit frontier during the War of 1812,” by Guillaume Teasdale, an article from the May 2012 special edition of Heritage Matters entitled Understanding the French experience in Ontario.